« 29. Passover – What Now? 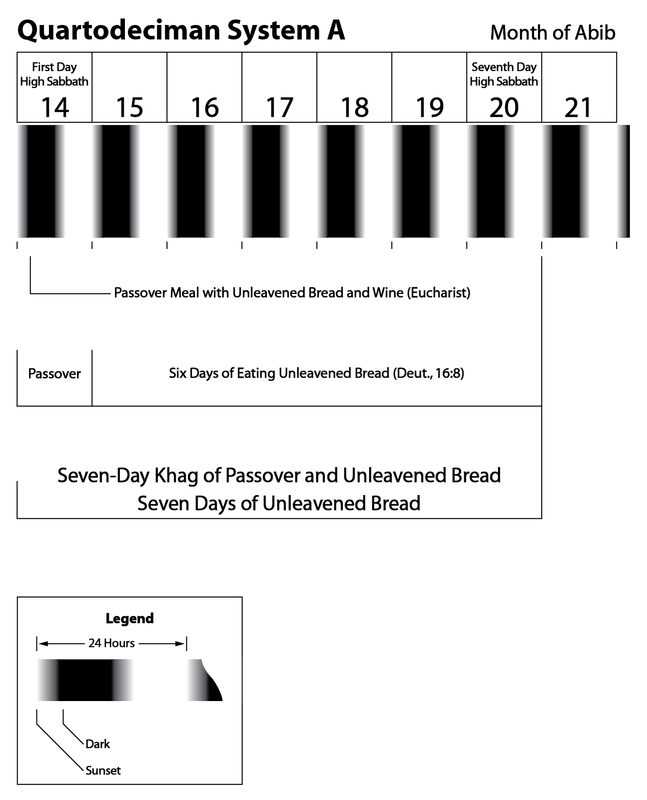 This investigation sets forth the reasoning that when the original instructions for the Passover are read with an unbiased mind the solution for the true practice of the Festival of Passover and Unleavened Bread can be attained. This study will also offer an alternative to both systems which we will label System A. Both System G and System A have the Passover supper take place at the beginning of Abib 14. 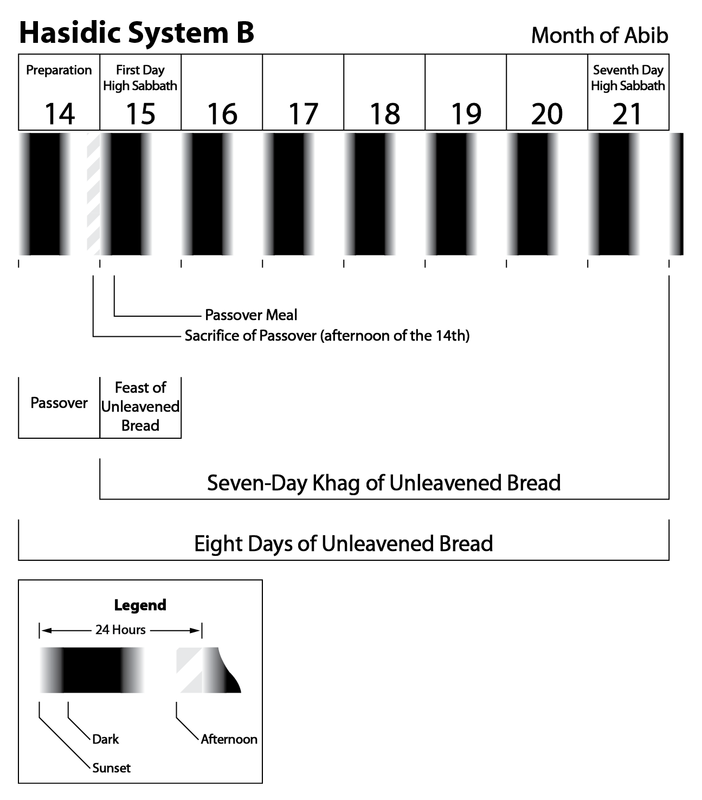 System A differs from System G in that it considers Abib 14 to be the first day of the 7-day Festival of Passover and Unleavened Bread. Abib 14 and 20 are High Sabbath days. 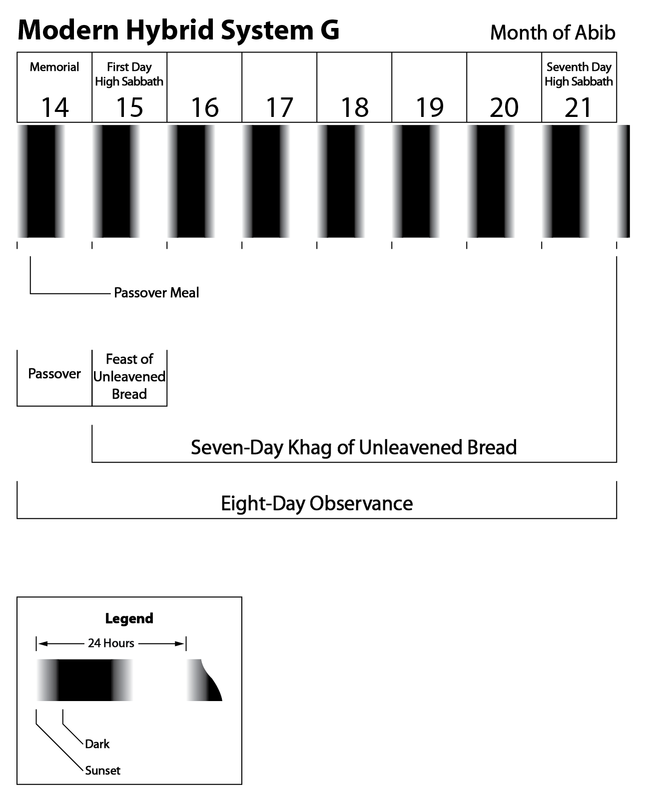 There are only 7 days of eating unleavened bread. Further, the reader should have an unbiased mind toward any predetermined conclusions but he or she will have to apply the same type of investigative techniques as a detective would in order to solve a crime. The truth of the matter is that most people are not trained in such investigative techniques. Nevertheless, we can proceed with our investigation because we will employ an evidentiary approach to uncovering the truth of Scriptures. As we proceed, facts will be presented from the book of Exodus thereby allowing the reader to utilize scriptural forensics while assembling the pieces of evidence to unravel the days of Passover and Unleavened Bread. Here is the method. The relevant verses will be given in three ways—English, Hebrew Masoretic Text (BHS), and the Greek Septuagint (LXX). We will utilize all three when necessary to help us during our investigation. There will be emphasis given with all caps along with hot links to the associated definitions contained in the Hebrew and Greek lexicons. Other notations will be explained as we go along. After each relevant verse, the forensics employed will be explained to elicit the true facts. As you will notice, some verses are self explanatory and will need no comment. When necessary we will employ other scriptures to define certain terms that need further clarification. One other thing will help immensely. Erase any preconceived thoughts about the Festival of Passover and Unleavened Bread, and proceed as if you are hearing the instructions from Yahweh for the first time as Moses and Aaron did during the Exodus. Looks like this is going to be interesting so let’s begin our interrogation of the book of Exodus. This month [is] to you the beginning of months: it [is] the first month of the year to you. LXX – Ο μὴν οὗτος ὑμῖν ἀρχὴ μηνῶν, πρῶτός ἐστιν ὑμῖν ἐν τοῖς μησὶν τοῦ ἐνιαυτοῦ. The facts indicate that Yahweh is speaking to Moses and Aaron on Abib 1 of the New Year. LXX – λάλησον πρὸς πᾶσαν συναγωγὴν υἱῶν Ἰσραὴλ λέγων Τῇ δεκάτῃ τοῦ μηνὸς τούτου λαβέτωσαν ἕκαστος πρόβατον κατ᾿ οἴκους πατριῶν, ἕκαστος πρόβατον κατ᾿ οἰκίαν. The word “ON” is being emphasized to indicate that the Hebrew is quite specific as to when the lamb is being taken. On the tenth day of the month. The Hebrew בֶּ be is an “inseparable preposition.” See link. And if the household be too little for the lamb, let him and his neighbour next unto his house take it according to the number of persons; every man according to his eating shall make your count for the lamb. LXX – ἐὰν δὲ ὀλιγοστοὶ ὦσιν οἱ ἐν τῇ οἰκίᾳ ὥστε μὴ εἶναι ἱκανοὺς εἰς πρόβατον, συλλήμψεται μεθ᾿ ἑαυτοῦ τὸν γείτονα τὸν πλησίον αὐτοῦ· κατὰ ἀριθμὸν ψυχῶν ἕκαστος τὸ ἀρκοῦν αὐτῷ συναριθμήσεται εἰς πρόβατον. LXX – πρόβατον τέλειον ἄρσεν ἐνιαύσιον ἔσται ὑμῖν· ἀπὸ τῶν ἀρνῶν καὶ τῶν ἐρίφων λήμψεσθε. And you shall keep it up UNTIL the fourteenth day of the same month: and the whole assembly of the congregation of Israel shall kill it BYN HA-ARABIM (BETWEEN THE EVENINGS). LXX – καὶ ἔσται ὑμῖν διατετηρημένον ἕως τῆς τεσσαρεσκαιδεκάτης τοῦ μηνὸς τούτου, καὶ σφάξουσιν αὐτὸ πᾶν τὸ πλῆθος συναγωγῆς υἱῶν Ἰσραὴλ πρὸς ἑσπέραν. The lamb shall be kept AD (UNTIL) Abib 14 (see definition of the Hebrew and Greek words per the hotlinks). The Hebrew word AD can be inclusive or exclusive depending on context. The exclusive meaning would have the lamb sacrificed at the beginning of Abib 14 at sundown. System B makes AD to mean inclusive, therefore the lamb could be kept alive well after sunset of Abib 14. The lamb is to be killed BETWEEN THE EVENINGS. The Hebrew phrase BYN HA-ARABIM means either “just after sunset” (System A, System G ) or “the late afternoon” (System B). Refer to the hot links for the Hebrew and Greek words and their definitions. It will become evident what meaning is correct and therefore, at what time the Passover lamb was killed as we proceed. LXX – καὶ λήμψονται ἀπὸ τοῦ αἵματος, καὶ θήσουσιν ἐπὶ τῶν δύο σταθμῶν καὶ ἐπὶ τὴν φλιὰν ἐν τοῖς οἴκοις ἐν οἷς ἐὰν φάγωσιν αὐτὰ ἐν αὐτοῖς. And they shall eat the flesh IN THIS NIGHT, roast with fire, and UNLEAVENED BREAD; and with bitter herbs they shall eat it. LXX – καὶ φάγονται τὰ κρέα τῇ νυκτὶ ταύτῃ ὀπτὰ πυρί, καὶ ἄζυμα ἐπὶ πικρίδων ἔδονται. We now have conclusive proof of the meaning of byn ha-arabim as being the period of time just after sunset and before dark at the beginning of the day. The flesh is to be eaten IN THIS NIGHT. THIS NIGHT has to occur on the same day as when the lamb was killed byn ha-arabim. Scriptures have already established that this day was Abib 14. If one were to kill the lamb during the afternoon of Abib 14 then the night would occur on Abib 15 in direct conflict with the instructions from Scriptures. The flesh was to be eaten IN THIS NIGHT of Abib 14. Importantly, one begins to eat UNLEAVENED BREAD with “it” (the Passover lamb) at the start of Abib 14! And you shall let none of it remain UNTIL MORNING, anything that remains UNTIL MORNING you shall burn. LXX – οὐκ ἀπολείψεται ἀπ᾿ αὐτοῦ ἕως πρωί, καὶ ὀστοῦν οὐ συντρίψεται ἀπ᾿ αὐτοῦ· τὰ δὲ καταλιπόμενα ἀπ᾿ αὐτοῦ ἕως πρωὶ ἐν πυρὶ κατακαύσετε. More proof that byn ha-arabim is the beginning of the day just after sunset. After eating the flesh “THIS NIGHT” of Abib 14, whatever remained ad baqar (until morning) was to be burned. The Hebrew word baqar means early morning before sunrise (see link). Also see the Greek term proi (see link). In this manner you shall eat it: your loins girded, your sandals on your feet, and your staff in your hand; and you shall eat it in haste. It is Yahweh’s passover. LXX – οὕτως δὲ φάγεσθε αὐτό· αἱ ὀσφύες ὑμῶν περιεζωσμέναι, καὶ τὰ ὑποδήματα ἐν τοῖς ποσὶν ὑμῶν, καὶ αἱ βακτηρίαι ἐν ταῖς χερσὶν ὑμῶν, καὶ ἔδεσθε αὐτὸ μετὰ σπουδῆς· πάσχα ἐστὶν Κυρίῳ. The instructions are to eat the Passover meal in haste, being prepared to travel. The Israelites knew they were not permitted to leave their location because of their being slaves to the government of Egypt. Therefore there would be an expectation that sometime shortly after the Passover meal there would be a change of status for the Israelites, allowing them freedom to travel from their location in Goshen. For I will pass through the land of Egypt THIS NIGHT, and will smite all the firstborn in the land of Egypt, both man and beast; and against all the eloahi of Egypt I will execute judgment: I am Yahweh. LXX – καὶ ἐλεύσομαι ἐν γῇ Αἰγύπτῳ ἐν τῇ νυκτὶ ταύτῃ, καὶ πατάξω πᾶν πρωτότοκον ἐν γῇ Αἰγύπτῳ ἀπὸ ἀνθρώπου ἕως κτήνους, καὶ ἐν πᾶσιν τοῖς θεοῖς τῶν Αἰγυπτίων ποιήσω τὴν ἐκδίκησιν· ἐγὼ Κύριος. THIS NIGHT all the firstborn of Egypt will be killed by Yahweh. THIS NIGHT has to occur on same day as when the Passover meal was eaten, Abib 14. The Hebrew and Greek words agree regarding THIS NIGHT (see links). LXX – καὶ ἔσται τὸ αἷμα ὑμῖν ἐν σημείῳ ἐπὶ τῶν οἰκιῶν ἐν αἷς ὑμεῖς ἐστὲ ἐκεῖ· καὶ ὄψομαι τὸ αἷμα, καὶ σκεπάσω ὑμᾶς, καὶ οὐκ ἔσται ἐν ὑμῖν πληγὴ τοῦ ἐκτριβῆναι ὅταν παίω ἐν γῇ Αἰγύπτῳ. Yahweh will not afflict the houses smeared with blood. Yahweh will also be the one smiting and destroying the land of Egypt. THIS DAY shall be for you a memorial day, and YOU SHALL KEEP IT AS A KHAG (FESTIVAL) to Yahweh; throughout your generations you shall observe it an ordinance for a world-age lasting time. LXX – καὶ ἔσται ἡ ἡμέρα ὑμῖν αὕτη μνημόσυνον, καὶ ἑορτάσετε αὐτὴν ἑορτὴν Κυρίῳ εἰς πάσας τὰς γενεὰς ὑμῶν· νόμιμον αἰώνιον ἑορτάσετε αὐτήν. Notice that most English translators have added the word “as” to the verse which is not in the original texts. THIS DAY, Abib 14, is not only a memorial day but is also a KHAG (FESTIVAL DAY). See links to Hebrew and Greek words. The Festival of Passover is an ordinance or statute to be kept and observed for a world-age lasting time. Be sure to continue with the second installment of our Exodus investigation titled: 31. Passover – Exodus Interrogated II. This entry was posted on 03/07/2013, 3:49 pm and is filed under Exodus, Feast Days, High Sabbaths, Holy Days, Passover, Religion, Unleavened Bread, Yahweh. You can follow any responses to this entry through RSS 2.0. You can leave a response, or trackback from your own site.